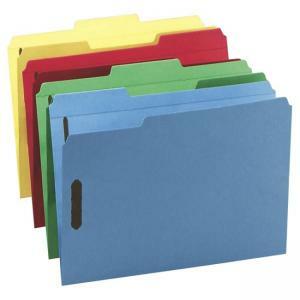 Durable top-tab folders with 2" prong K-style fasteners speed filing and retrieval. Two fasteners per folder provide two separate filing surfaces. Keep meeting notes on one side and written drafts on the other. Folders feature 1/3 cut assorted tabs. Scored for 3/4" expansion. Reinforced tab is 1/2" high. Each folder is made from 11 point stock.